News of another November sale now as Italian brokerage house Whyko closes on the sale of the 26.75m motor yacht Marcelina. Built in 2007 by Italian superyacht builder Sanlorenzo in 2007 as one of the yard's SL88 series, Marcelina features an interior in bleached teak panelling with parquet flooring. 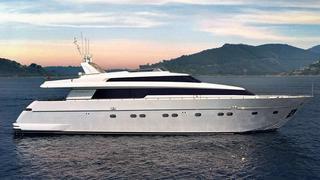 Accommodation is for eight guests in four staterooms plus four crew. The master suite has a king size bed, and walk in wardrobe while the VIP stateroom comes with a queen size bed. There are two further twin cabins, each with a Pullman berth and all staterooms have entertainment systems and en suite facilities. A spacious sundeck is ideal for entertaining with sunbathing pads, bar, icemaker and electric Bimini top. Twin 1,925hp Caterpillar engines give her a cruising speed of 24 knots, maximum speed of 28 knots and a range of 767 nautical miles at 11.5 knots.